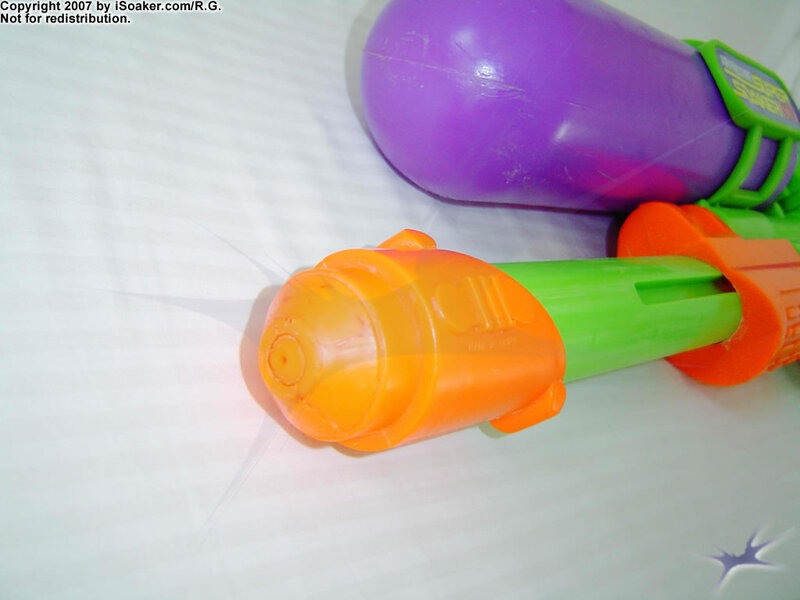 The Super Soaker SS 60 was released in 1993, being a smaller, more compact version of the Super Soaker SS 100. 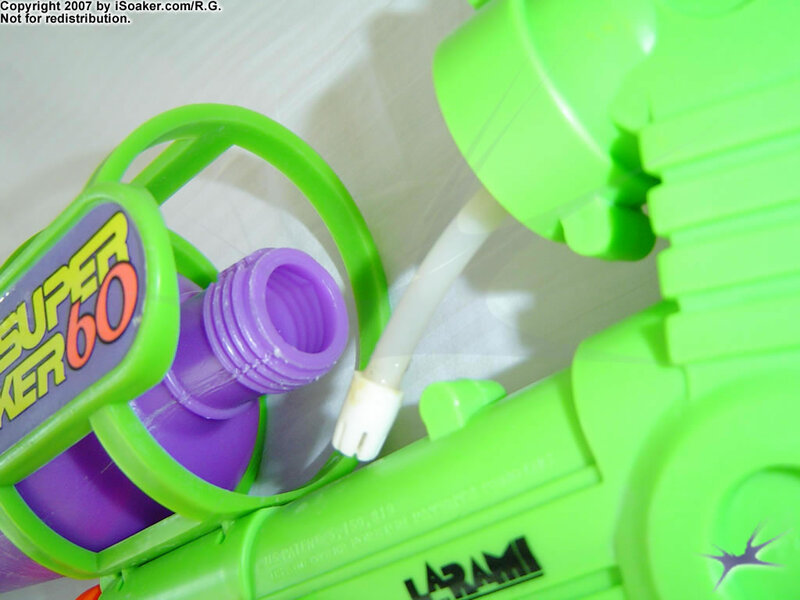 Along with the SS 60, Larami Corp. also released the Super Soaker SS:MDS which is basically a modified SS 60 with an adjustable nozzle (See: SS MDS: Classic Series review for more details). The one reviewed here at iSoaker.com has been previously used and shows notable signs of wear. However, despite this blaster being well over 10 years old, it still appears to perform well, a tribute to its craftsmanship. Thus, a full review could be performed. The SS 60 features a slightly enhanced original/classic-series type nozzle. As such, it is notably smaller than the XP Series nozzles, but does appear to have slightly more body than the original Super Soaker SS 50's nozzle. Stream lamination from these early Super Soakers was not great, but compared to virtually any other stock soaker of its time, soakers like the SS 60 performed significantly better than anything else on the market. Like the Super Soaker SS 100, the SS 60's nozzle is powered by a separate pressure chamber. Though smaller than the SS 100's pressure chamber, this also means less pumps to reach maximum pressure. However, shot time is remains quite respectable. Like the SS 100, the SS 60 also features a tracked, barrel pump. This pump glides well, though its larger surface area in contact with the barrel does result in a little more potential friction than in modern tracked pumps. Pump volume is not large, but it is adequate to pressurize the firing chamber well within 20 to 30 pumps. The grip on the SS 60 is textured, yet comfortable to hold. The trigger pulls easily and feels relatively sturdy. Considering that the model tested is over 10 years old at the time of testing and has definitely been well used (as can be seen by the scratches on the reservoir), this shows that the trigger mechanism is rather rugged and long-lasting. Being an original-style pinch valve system, there is a slight delay between pulling the trigger and the stream actually firing. 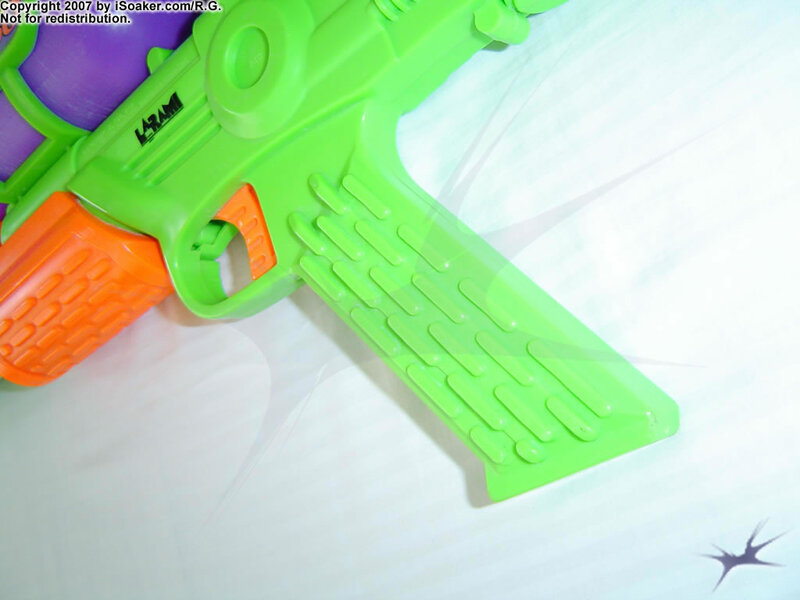 However, this delay is likely more pronounced in the soaker being tested due to its age and may have been much less noticable had this been a newly manufactured water blaster. The reservoir on the SS 60 holds a very respectable amount of water, easily hold many more fold water than the non-Super Soaker water blasters available during its time. Having a separate pressure chamber, the SS 60's reservoir could be filled, then the firing chamber filled/pressurized, followed by a reservoir top off to maximize available water. The main shortcoming to these early designs (though still present in some modern designs) is the need to have an intake tube in the reservoir to draw in water into the pump. Though well-shaped and positioned, the intake tube just cannot quite make use of every last drop of water in the reservoir. Of course, holding much more water than anything else on the market in its day, the minute amount left in the reservoir was not much of an issue. Separate firing chamber. Sturdier build than earlier models. Good capacity. Small stream and firing chamber compared to larger soakers. Pump volume on the small side. No strap. Should be primed for best stream performance. Generally less rugged design compared to newer soakers (granted, the one tested still performs well though over 10 years old). Review: The SS60 is a useful, moderately-sized blaster. With a much thicker stream than the SS50, the SS60 was definitely a competitor. It greatly outdoes the SS50 in range and output, and is also much larger. This blaster can most accurately be described as a midway blaster between the SS50 and the SS100, and it's output is consistent with that. Although it can most definitely outdo other blasters of it's time, the SS60 can not be recommended as a main blaster against any modern gun, except perhaps the smaller xps, - the XP20, XP215, the XP220, etc. Now, it can be used more as a novelty weapon and for having fun, rather than a serious battle arm.